Even though we started our Full Time RVing experience last Spring and spent more than six months on the road last year, we still had our house. So we came back to Tucson to deal with it. 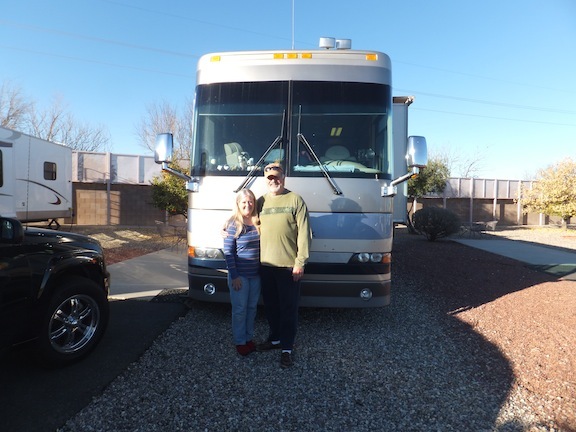 Now we’ve sold our house, cleaned it out and can continue our lifestyle as Full Time RVers. We have a few things in storage, but for the most part what we have with us is what we have…period…for the next several years. Figuring that all out…what to take, what to store and what to get rid of is a whole “nother” story for a different day. Suffice it to say, it was complex. But our marriage survived and we’re back speaking to each other now and looking forward to our adventure. We restarted our journey today when we left Tucson and drove to Las Cruses, NM. Even though we have over 116,000 miles on our coach, it was still different leaving this time. We were both nervous for some reason. We are now untethered… no more house. Our coach is now our only home. So here we are…our first night out on this trip and really going through some emotional thoughts. It just feels different. I’m sure this will pass as we get back into the routine of things, but tonight… it just feels different. When we left Tucson, the city was recovering from a week of bizarre weather. We actually had 3 inches of snow a few days before we left. Not good for the gem show, Rodeo and PGA Match Play tournament all taking place last week. Anyway, we’ve been nice and toasty in our coach for about a week now while we repack everything we brought with us, took care of a few last minute things and said good bye to our dear friends. That part was really tough! So the time has come to continue what we started last May. We are now embarking on the next chapter of our lives, which is to see the country. We’ve always said we’d be out for two years but our bucket list keeps growing so I’m not sure we can finish everything in that amount of time. I guess we’ll have to wait and see. 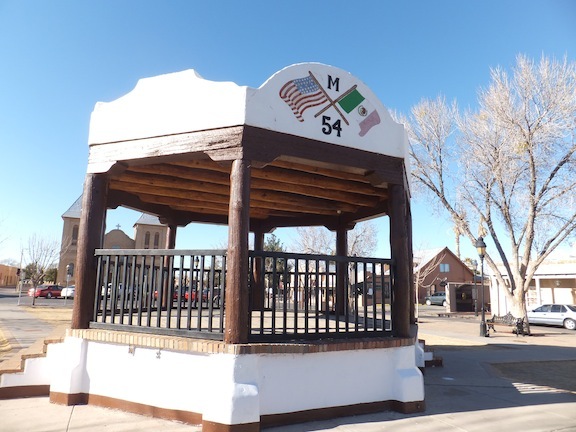 We arrived in Las Cruses mid afternoon and even though we were here last Spring, we wanted to revisit Mesilla Square, a quaint, very historical town square. It’s complete with a cathedral on one edge of the square, unique stores down both sides and of course four-star restaurants in between. In the middle of the square is a bandstand and references to the last Mexican territorial purchase by the US in 1854 known as the Gadsden Purchase. It’s a delightful little village with lots of history. There is so much to see and learn about and such limited time. From here we head out tomorrow to Fort Stockton, TX, then Junction, TX the next night and land on Mustang Island near Corpus Christi on Thursday. That is our first destination and we plan to stay there a month. We heard about Gulf Waters RV Park from someone we met on the Oregon Coast last summer. They told us it was like paradise and shouldn’t be missed. I guess we’ll find out soon. I’ll be sharing our experiences with you along the way and am pleased to have you join us. If you have any places you think we should go see, write to us in the comments. We’d love to hear from you. That’s it for now…take care! we are planning on going full time in just over a year what do you do about your drivers lic and the plates on the vehicles ? That’s a very good question and I’ve had others ask the same thing. Each state has its own requirements for residency. If you want to remain a resident of the state you’re currently in, then you need to look up the stipulations for that state. There are several companies out there that cater to the full time RVer. Escapees in Texas is one that offers residency in Texas after a 30 day stay. They will also provide you with a mail service. We chose to become residents of South Dakota and worked with a company called My Dakota Address. We had to stay in South Dakota at least one night and bring proof of that stay (show the RV park receipt) to the licensing bureau. We got SD driver’s licenses and licensed all of our vehicles, including the car we had in storage. My Dakota Address provided us with a street address where we had all of our mail sent. Every day we get mail, we get an email telling us what it is. Then we tell them where to send it and when. They’ve been wonderful to work with. There are other companies out there that offer similar services. If you Google mail services for full time RVers you’ll get a list of them. Read through their requirements and determine which one fits your needs the best. Neither Texas nor South Dakota have State income taxes, so that’s another thing to consider. Be sure to get as much of your bill paying and banking set up online. That eliminates a large chuck of mail. Also, you can get most magazines online as well. You will be charged for the forwarding of your mail so get rid of the heavy stuff. I hope that helps. If you have any other questions, please let me know. Thanks a bunch that helps a lot.